I was recently contacted by the kind people at Renshaw asking if I would like to enter a competition they are running. When I said ‘yes’, they sent me a goodie box of their icing and marzipan, which they specialise in. The competition is to make a cake, using at least one of the ingredients in the box supplied, and the cake is to celebrate the imminent birth of the Royal Baby. I always say that I am not a cake decorator, but I do like to set myself a challenge. I won’t tell you what the prize is as I don’t want to jinx my chances!! I decided to make a cake that looked like a cushion draped with the Union Jack and upon that a pair of baby booties. Now, looking at the picture above and below, it looks as if I have already decided that the baby will be a boy. In reality, I thought the blue looked better next to the Union Jack! Pre-heat your oven to 180oC. Line a 9”x13” baking pan with greaseproof paper and grease the paper. Place all of the ingredients in a mixing bowl and beat until the mixture is smooth and pale and golden in colour. Transfer the cake batter to the baking pan and spread out to an even level. Pop into the oven for 20 minutes, or until a toothpick comes out clean from the centre. Leave in the pan for 10 minutes, before removing and allowing to cool fully on a cooling rack. When cooled, cut the rectangular cake down the middle, to give you two smaller rectangles. Taking a jam of your choice, dollop a good few tablespoons on one half, spreading out. Place the other half of the cake on top. This is where I rolled out the Renshaw white icing, ready to cover the cake. I used lime curd, heated in the microwave a little, to spread over the cake. I then placed the white icing on top, using a rolling pin to help me. I rolled out red and blue Renshaw icing, cutting shapes to form the Union Jack and I made little tassels from yellow icing. I formed little booties from more blue icing, and little hearts from leftover white. You can see the result in the pictures above. I like to call the cake ‘Booties for Britain’. I hope the folks at Renshaw like the finished article, fingers crossed I am in with a chance of winning. Oh yes, and all the best to Kate and Wills on the forthcoming event! 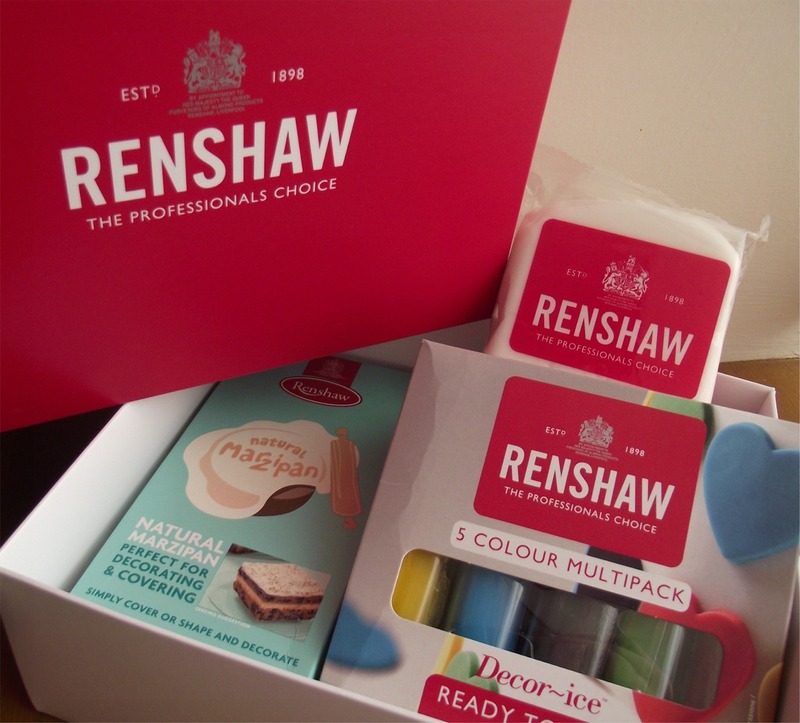 Disclosure Statement: I received the Renshaw products free to use. I have not been paid for this post. Any opinions expressed are my own. The cake looks fabulous - those booties and tassels are so cute! !